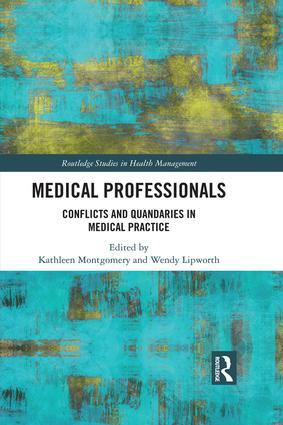 Medical Professionals: Conflicts and Quandaries in Medical Practice offers a fresh approach to understanding the role-related conflicts and quandaries that pervade contemporary medical practice. While a focus on professional conflicts is not new in the literature, what is missing is a volume that delves into medical professionals’ own experience of the conflicts and quandaries they face, often as a result of inhabiting multiple roles. The volume explores the ways in which these conflicts and quandaries are exacerbated by broader societal forces, including changing scientific and technological paradigms, commercialization, and strengthened consumer movements, which simultaneously expand the scope of roles and responsibilities that medical professionals are expected to fulfill, and make it more difficult to do so. Several empirical chapters analyze data from qualitative interview studies with clinicians and other stakeholders. The studies highlight the burdens on clinicians who are expected to make informed and justified judgments and decisions in the midst of competing pressures; authors describe the methods that clinicians use to address the associated tensions within specific contexts. Two conceptual chapters follow and offer some innovative ways to think about the challenges facing medical professionals as they strive to make sense of the changing landscape within healthcare. The first reflects on the challenges to clinical practice in the midst of shifting and often competing definitions of disease and associated ideologies of care. The second reflects more broadly on the utility of value pluralism as a framework for conceptualizing and working through moral and professional quandaries. The book concludes with a chapter containing suggestions for how members of the medical profession might reframe their thinking about their roles, responsibilities, and decision-making in the midst of inevitable quandaries such as those presented here. This book will be of vital reading for academics, researchers, educators, postgraduate students, and interested health care practitioners and administrators.